That sounds good, we went through a spell of eating stroganoff fairly regularly but tired of it. I did love the fact it was so quick though so this is definitely going on my “to cook” list. You’re right, it sounds like a delicious mid-week meal, and with all those delicious ingredients I know it has to be quite tasty. I would love to feature your recipe on our Demy, the first and only digital recipe reader. Please email sophiekiblogger@gmail.com if you’re interested :). Thanks! We tried this tonight. Don’t remember how I found you. 🙂 It was really good! Maybe a little onion-y but we like onions, so that’s still good. We had to use a sweetened cider, but I left out some honey and it seems to have worked out. Thanks for the recipe! i tried this recipe a few days ago; it woz delicious!! i ate it with carrots & boiled new potatoes mixed with sliced shallow fried apples. Really tasty, easy & quick to cook!! I tried this tonight and it was yummy! 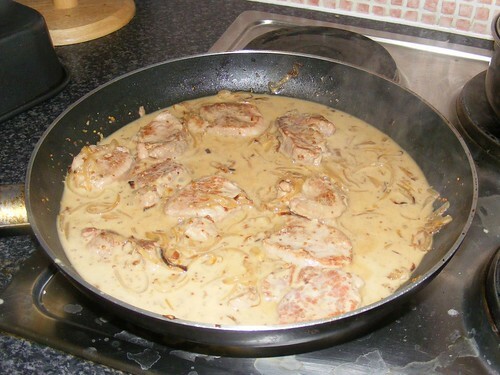 My sauce didn’t thicken much as it reduced, so I added a little cornflour to help it along. I also topped/decorated it with some finely diced and fried black pudding which worked well. Thanks for all the great recipes! I’ve tried your bread recipe (it worked!!) and made butter too! Is there a reason you stopped blogging, or have you moved elsewhere?